In August 1991 Elva and Gianluca decided to start a new activity based on their great passion: cookery. 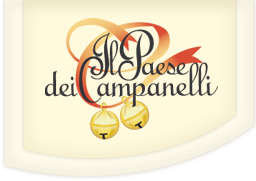 So they put their university degree in a drawer and built Il Paese dei Campanelli. The name doesn’t refer to the homonymous operetta, but it’s the nickname that relatives and friends had given to such a charming and fabulous place like Petrognano. It’s not easy to find the right words to describe the landscape that surrounds this village from 1200. Here was the city of Semifonte decantata da Dante extolled. Your visit won’t only be a pleasure for your taste, but also a dive in an environment and an atmosphere of old times. We offer you the warmth of the atmospheres of our history, you’ll be welcomed in the living colours and fragrances of our hills: we chose to be like the place that surrounds us, simple but very beautiful. Simplicity at the service of beauty: in a few words our style.